who make peace” (James 3:18). 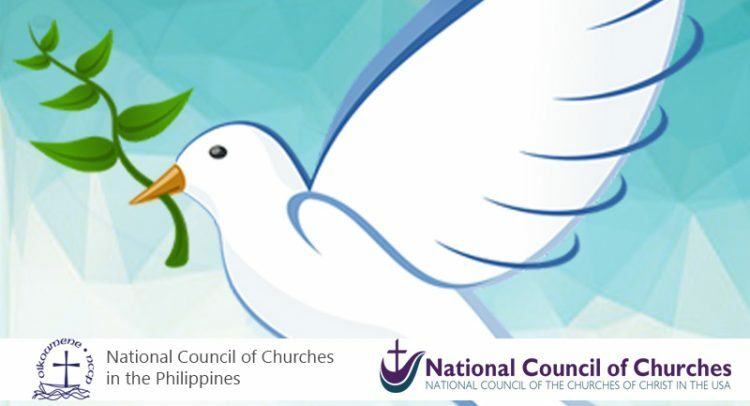 The National Council of Churches in the Philippines (NCCP) and National Council of the Churches of Christ in the USA (NCCC-USA), bound by our faith in Jesus Christ and our common witness for the fullness of life, reaffirm a shared commitment to support the formal peace talks between the Government of the Republic of the Philippines (GRP) and the National Democratic Front of the Philippines (NDFP). We uphold peace as the hope of all people and the formal peace talks as a platform and venue for principled negotiations to strive toward the attainment of this peace. As a platform, the peace talks aim to define concerns, resolve the roots of the armed conflict, and forge what all parties long for – a just, durable and sustainable peace. As a venue, government and all stakeholders gather to negotiate and resolve both historical and contemporary outstanding issues.